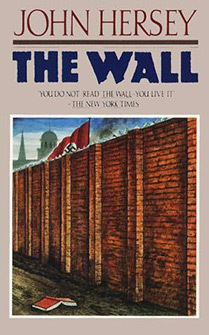 This book is the story of the Warsaw ghetto from November 1939 to May 1943 told by means of a fictional diary kept by Noach Levinson, self-appointed archivist of Polish Jewry. Mr. Hersey makes no attempt to tell the whole grim story, but concentrates on a manageable group of characters through whose reactions and fortunes the larger issues are projected and symbolized. The book ends with the Battle of the Ghetto of spring 1943, and the escape of a small remnant of fighters to join the Jewish partisans in the Lomiankì Forest. John Richard Hersey was a Pulitzer Prize-winning American writer and journalist considered one of the earliest practitioners of the so-called New Journalism, in which storytelling devices of the novel are fused with non-fiction reportage. During his lifetime, Hersey served in many posts connected with writing, journalism and education. He was the first non-academic named master of a Yale residential college. He was past president of the Authors League of America, and he was elected chancellor by the membership of the American Academy of Arts and Letters. Hersey was an honorary fellow of Clare College, Cambridge University. He was awarded honorary degrees by Yale University, the New School for Social Research, Syracuse University, Washington and Jefferson College, Wesleyan University, The College of William and Mary and others.